This development is surprising to anyone who remembers the highly publicized battles over fur and animal welfare of the 1980s and 1990s. Back then, shocking depictions of the cruelty inherent in fur production — often in the form of polemical and, critics said, misleading videos produced by pro-animal-rights fringe groups — were only starting to reach a wider audience. Protesters were omnipresent at fashion week and public pressure to avoid fur was high. Anna Wintour was served a skinned raccoon at the Four Seasons. It seemed like every week another of your favorite celebrities was stripping off for a PETA ad. By turn of the millennium, the moral issue of fur seemed settled, and fur itself seemed like a relic of a bygone age — something that your grandparents’ generation had misguidedly believed was okay, like golliwog dolls or smoking during pregnancy. The idea of wearing something so thoroughly politicized and icky as fur just seemed ugly. Popular culture kept up with the times: when Lily Esposito chided Mary Cherry for her mink coat on Popular, Mary Cherry looked like the spoiled, amoral wench that she was. But during the 2000s, things changed. Designers who hadn’t previously shown fur on the runway began showing it; designers who had previously shown some, showed more. Designers who had publicly pledged to abjure fur, like Giorgio Armani, went back on their word — as did a good number of those overexposed PETA “faces.” (Naomi Campbell even went so far as to do an ad campaign for the furrier Dennis Basso.) Fur began to creep back into fashion magazine pages. 1990s grunge and minimalism gave way to 2000s bling and ostentation. And now, fur is back in a big way. This year’s fall runways? 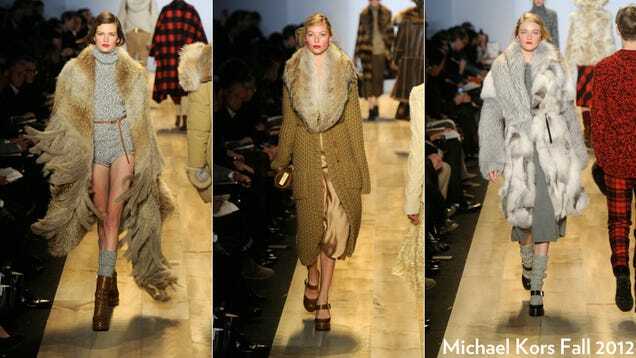 Among the designers who showed fur and/or shearling were Alexander McQueen, Dolce & Gabbana, Lanvin, Louis Vuitton, Michael Kors, Oscar de la Renta, Prada, Rebecca Minkoff, Salvatore Ferragamo, Tom Ford, Vivienne Westwood, and Yves Saint Laurent. This reversal is not merely the result of a cultural trend meeting its inevitable backlash. It’s also a story of economics, and of the fur industry’s quiet battle to rebrand its product as sustainable, natural, and luxurious. Last summer, for example, the designers Alexander Wang and Haider Ackermann, plus Alexa Adams and Flora Gill of Ohne Titel were flown to Copenhagen for weeklong visits to the design studios of Saga Furs, a marketing company that represents 3,000 fur breeders in Finland and Norway. Saga Furs regularly sponsors such design junkets. Established designers like Zac Posen now see no downside to collaborating with fur brands — c.f. Posen’s collection for Pologeorgis. Even a series of minor scandals over fur labeling hasn’t served to set back the industry. Five years ago, PETA founder Ingrid Newkirk said that only “old fogey designers like Karl Lagerfeld and so on” used fur, and that fashion’s new generation just wasn’t that into fur. Clearly, Newkirk was wrong. Whatever the case, fur is back in a big way. And it seems to be here to stay for the foreseeable future.